Our Candy Cart is our pride and joy. Our white Victorian style candy cart measures 6ft by 3ft and stands approximately 7ft high. 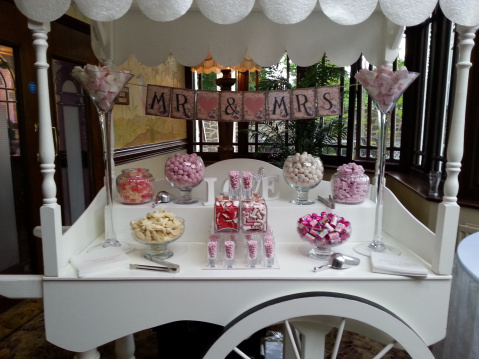 The cart and canopy are both of neutral colour, therefore having no colour clashing with the bridal party, and also allowing the colours of the sweets to radiate and steal the show. The tabletop of the cart is tiered allowing ease of reach and also a very attractive display. To secure your date we ask for a small deposit at the time of booking and the remainder to be paid before your event. We cater for weddings and events all over Northern Ireland and parts of the Republic of Ireland, so no matter where you are please get in touch.